This rich, buttery, nourishing creamy mask supplies a boost of Coenzyme Q10, an essential anti-oxidant which helps to reduce damage, strengthen and re-energize the skin. 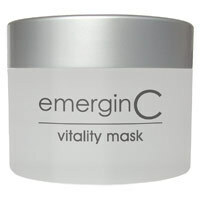 emerginC Vitality Mask soothes, calms, hydrates, nourishes and reduces redness. Formulated for all skin types. Excellent for rosacea and sensitive skin. Use as needed. Coenzyme Q10 reduces signs of aging by making wrinkles less likely to form and diminishing age spots corrects damage to the skin by preventing free-radical oxidation. Creams containing this ingredient may be appropriate for anyone seeing the early signs of aging (fine line, dull skin tone, etc. ), but it may be an especially good alternative to people who can't tolerate alpha hydroxy acids.